Winner of the Apple TV Promotion! Winner of the Apple® TV Promotion! On September 15th 2010 we announced that we would be giving away an Apple® TV along with free subscriptions to 5 random people. Today I would like to announce that we have a winner for the Apple® TV. 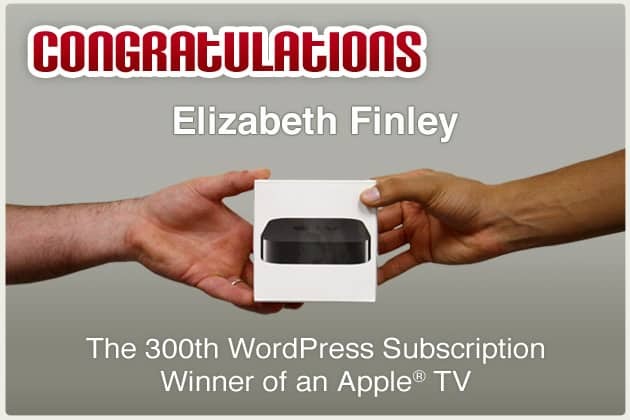 Congratulations, Elizabeth Finley from Durhan, North Carolina! We want to thank you – our users – for making this Apple® TV promotion possible. And thank you, Elizabeth, for accepting our gift. Elizabeth purchased WordPress for Joomla! for her corporate website, “Adolescent Pregnancy Prevention Campaign of North Carolina” (APPCNC – http://www.appcnc.org ). She did a lot of research to find the best blogging tool and found that WordPress for Joomla! fit the bill. With WordPress for Joomla!, her website will be able to provide content that is more responsive than what is currently available to visitors. APPCNC is going into its 25th year of existence. We are glad to hear that WordPress for Joomla! will assist them in leveraging their ability to communicate with their audience. Congratulations again Elizabeth, and we wish you and your organization tremendous success. This entry was posted in 'corePHP' and tagged wordpress on November 10, 2010 by The Core Team.